Elijah Poole was born in Sandersville, Georgia, on 7th October, 1897. In 1923 he moved to Detroit where he joined the Nation of Islam, a black nationalist and religious organization founded by Wallace Fard. Poole accepted Fard's teachings that African Americans could obtain success through discipline, racial pride, knowledge of God, and physical separation from white society. Poole took the name Elijah Muhammad and became Fard's assistant. When Wallace Fard mysteriously disappeared in June 1934, Muhammad became the new leader of the Nation of Islam (sometimes called Black Muslims). Muhammad, claimed that Fard was Allah (God) and that he had selected him as his messenger. Under the leadership of Muhammad, Black Muslims purchased large areas of land in the Deep South, invested in business ventures and had its own paramilitary force. Members were also instructed to completely abstain from all drugs. During the Second World War Muhammad advised his followers to avoid the draft. This led to him being charged with violating the Selective Service Act and was jailed between 1942 and 1946. After his release from prison, Muhammad he gradually built up the membership of the Black Muslims. He described African Americans as the chosen people and urged the adoption of a religion based on the worship of Allah. Muhammad also called for the establishment of a separate nation for African Americans. In the late 1950s Malcolm X emerged as the most important figure after Muhammad in the Nation of Islam. He went on several speaking tours and helped establish several new mosques. He was eventually assigned to be minister of the mosque in New York's Harlem area. Founder and editor of Muhammad Speaks, Malcolm became more extreme in his views. In 1963 Malcolm X was suspended from the movement by Muhammad after he made a series of extremist speeches. This included his comments that the assassination of John F. Kennedy was a "case of chickens coming home to roost". In March 1964 Malcolm left the Black Muslims and established his own religious organization, the Organization of Afro-American Unity. After a pilgrimage to Mecca, Malcolm rejected his former separatist beliefs and advocated world brotherhood. Malcolm X was shot dead at a party meeting in Harlem on 21st February, 1965. ThreeBlack Muslims were later convicted of the murder. 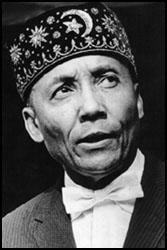 Elijah Muhammad died in Chicago on 25th February, 1975. After his death, his son became leader of the Muslim American Community whereas the Black Muslims were led by Louis Farrakhan.